NOTE: Civilization VI on Steam is required in order to activate and play Gathering Storm on Steam. Steam keys are NOT compatible with the Mac App Store version of Civilization VI. Mac App Store players can purchase DLC from within the app. 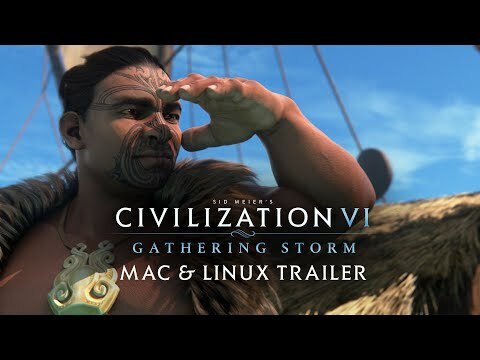 Sid Meier’s Civilization® VI: Gathering Storm is coming soon to Mac and Linux! In Gathering Storm, the second expansion to Civilization VI, the world around you is more alive than ever before. Chart a path to victory for your people by developing new advanced technologies and engineering projects and negotiating with the global community in the World Congress on critical issues. The choices you make in the game will influence the world ecosystem and could impact the future of the entire planet. Natural disasters like floods, storms, and volcanoes can pillage or destroy your Improvements and Districts – but they may also refresh and enrich the lands after they pass. In addition to these new systems, Civilization VI: Gathering Storm introduces eight new civilizations and nine new leaders. Seven new world wonders can be constructed, as well as a variety of new units, districts, buildings, and improvements. ©2018 Aspyr is a registered trademark of Aspyr Media, Inc., and the Aspyr star logo is a trademark of Aspyr Media. Mac and the Mac logo are trademarks of Apple Computer, Inc., registered in the U.S. and other countries. All other trademarks and trade names are the properties of their respective owners. Take-Two Interactive Software and its subsidiaries. Sid Meier's Civilization, Civilization, Civ, 2K, Firaxis Games, Take-Two Interactive Software and their respective logos are all trademarks of Take-Two Interactive Software, Inc. All other marks and trademarks are the property of their respective owners. All rights reserved.